save killer whales and the chinook that sustain them? Michelangelo's famous statue La Pieta -- "The Pity" in Italian -- has been the object of Christian and artistic devotion for centuries. Carved from a single block of marble, it depicts the Virgin Mary holding the dead body of her son, Jesus Christ. No visitor can miss its presence at St. Peter's Basilica in Vatican City. Though her ordeal is now over, the grieving mother -- called J35 by researchers but more commonly known as "Tahlequah," after a city on Vashon Island -- is still the focus of the 4,500-member Lummi Nation of western Washington. The Lummis consider Tahlequah and her family, including her cousin, J50, to be close relatives, fully deserving of our compassion, care and protection. Tahlequah's family live in Puget Sound in three family groups, known as pods. At this point, their number has dwindled to 75, the lowest in decades. Even more worrisome is the fact that there hasn't been a healthy calf born to the three pods in several years. Perhaps it was fortuitous that the mother orca's journey took place at around the same time that Washington Gov. Jay Inslee, D, convened an Emergency Orca Task Force and charged it with devising a strategy to save the whales. The task force is made up of 45 state, federal and tribal scientists and leaders, along with representatives from nongovernmental groups and the business community. Its initial set of recommendations is due in November of this year. Despite the protection of the Endangered Species Act and the billions of dollars that have been spent on recovery efforts over the past 30 years, Pacific Northwest salmon continue on a downward spiral, victims of a growing human population and the economic development that accompanies it. Yet Pacific Northwesterners, who have historically believed they could have it all -- including a booming economy along with a pristine natural environment -- may be finally coming to terms with the limits of growth. Tahlequah's 17-day public display of grief, combined with a summer of unprecedented wildfires and smoke, riveted people's attention on the vulnerability of the natural world. But it will take more than sympathy and prayers to reverse the decline of the orcas and the salmon. The jury is still out as to whether the region's citizens can muster the political will to take meaningful action. A case in point is the decades-old unsuccessful call by many salmon defenders to breach four Snake River dams that are considered especially destructive to salmon. At a recent meeting of the orca task force, Joseph Bogaard, executive director for Save Our Wild Salmon, spelled out what was at stake: "Scientists and salmon advocates have long advised Northwest policymakers (that) the longer we delay truly protecting and restoring endangered wild salmon and steelhead populations, the greater the pain. "The urgent plight of the orcas today tragically illustrates this point. 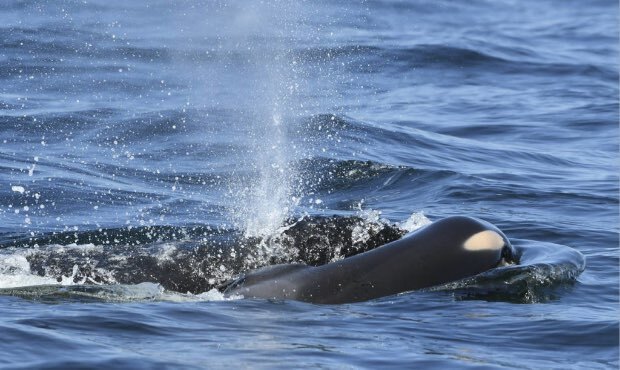 The survival of southern resident orcas depends today on urgent science-guided action, creative political leadership and a commitment by people who live in the Northwest." It's not a new message, but Tahlequah's moving pilgrimage has brought it into clearer focus than ever before. The orcas are among the most beloved creatures in the Pacific Northwest, an area where many residents relate to the natural world with a devotion bordering on the religious. Whether a comprehensive regional response comes in time to save the orcas remains an open question. But if the citizens of the region can come together to act, Tahlequah's sad journey will not have been in vain. John Rosenberg is a retired Lutheran pastor and an active volunteer in regional salmon recovery efforts. He lives in Tumwater, Oregon.